Benjamin Reiss studied art history in Paris, then went to the Emile Cohl School in Lyon to study comic art. After graduating, he worked in Paris for the video game and animation industry. In 2000, he met a Japanese girl in Lyon and decided to visit her at home in Tokyo. His stay in Japan was intended to last one year but lasted six! In Tokyo, Benjamin assisted Japanese comic artists and discovered the hard way how manga are produced. Among others, he worked with the mangaka of Welcome to the NHK and with Igarashi Megumi, an artist charged with obscenity for using her genitalia as artwork. 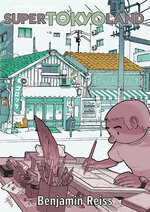 After two years of that experience, he decided to use comics to document his life in Japan — not as a tourist but as an inhabitant and stranger in the big city. The first version of that graphic novel, called Tokyoland, was published in France in 2009. A revised and extended version, Super Tokyoland, was published in 2015, and will be translated to English in 2017.